Czech it out! We now sell tickets for the private carrier LEO Express, which operates trains and coaches all over the Czech Republic (also known as Czechia) and even to some destinations in neighbouring countries. All aboard the LEO Express! LEO Express is a young private company founded in 2010. The company launched its first train down a track that connects Prague to Ostrava in 2012. Now they operate trains from Prague to Košice in Slovakia and Leo Express also offers a fleet of coaches between many cities, including some beyond Czech borders. Economy Class, the equivalent to a classic second class. This includes WiFi, a movie and games portal, and on board cafe-restaurant. Business Class, which includes food and a beverage in the ticket price, as well as a more comfortable and roomy interior. Premium class, which includes fully reclining seats with built-in massagers, in-seat meal service, and access to a convenient parking space near the Prague train station. For families, Leo Express trains also have a children’s compartment. Going by the official photo of their site, it looks like the ticket inspectors disguise themselves in an adorable mascot costume to visit kids in these happy compartments. Some coaches also offer two classes of comfort: Classic and Business. The differences between the two classes are more or less the same as on the trains: Business Class offers more space between each seat and a few other bonuses like: a sleep kit akin to what you’d receive from an airline and non-alcoholic beverages included in the ticket price. If Prague is the only city that comes to mind when you think of the Czech Republic, LEO Express will expand your horizons with inexpensive train and coach tickets to other cities throughout this beautiful country. For the railway line, tickets between Prague and Olomouc start at only 5 Euro. A bargain for a travel time of 2 hours! Coaches offer a great sightseeing opportunity: the beautiful Pilsen (or Plzeň) is less than an hour and a half from Prague, with tickets that start at 2.70 Euro. The chance to save money on the ride to enjoy a local Pilsner fresh from the brewery is irresistible. You can also visit Český Krumlov and see a UNESCO World Heritage Site. From Prague, LEO Express will take you there in less than three hours by coach, for only 7 Euro! Today, LEO Express trains and coaches connect 81 cities in 8 different countries: in addition to the Czech Republic, you can travel to Germany, Austria, Slovakia, Poland, Hungary, and Ukraine. You may have heard about Locomore, the German rail operator financed in part by crowdfunding that linked Berlin and Stuttgart for a while (via Hanover, Frankfurt, or Heidelberg). We admired the initiative and were fervent supporters of their beautiful orange carriages. We were saddened when we caught news of the company’s bankruptcy last May so it is with absolute pleasure that we welcome this new announcement: since August 24th 2017, traffic has resumed on this line following a partnership between LEO Express and Flixbus. That’s not all: Locomore tickets are now available in Trainline’s search results! We’re happy to offer you more options to travel between Berlin and Stuttgart: high-speed and regional trains operated by the German rail carrier Deutsche Bahn, Flixbus coaches, and now Locomore long-distance trains. To a new year and furthering frontiers! The holiday season is about many things: filling our gullets with as much pudding and pumpkin pie as possible of course, but it’s also about spending time with those we love and reminiscing about the good times we’ve shared together. In January 2017 we made some special resolutions that we’ve successfully realised, and we’d like to celebrate a few of those victories with you. We’ve always had you in our hearts and in our minds while pursuing our greatest ambitions. Pull up a chair, let’s get cosy, roast some chestnuts over a warm fire, and reflect. Between December 2016 and January 2017 we worked on a super secret mission to offer free youth tickets with TGVMax on the day of its official release, both on our website and mobile apps. This was a big achievement for us and a momentous opportunity for travellers between the ages of 16-27. We have certainly made good use of it ourselves! 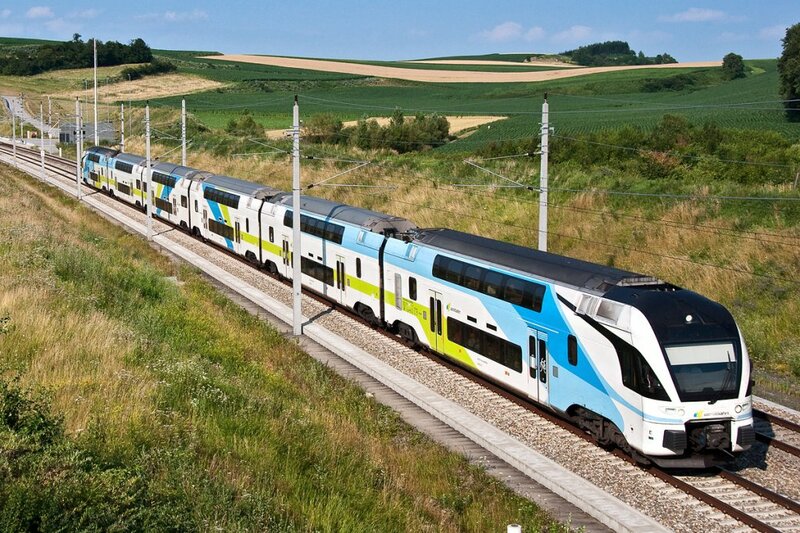 Those in our offices who subscribed to TGVMax have toured hundreds of thousands of kilometres throughout the countryside of France, mainly on their way from Paris to sunnier climates (who can blame them?). Taking it to the TGVMax. After months of what seemed like showing a preference towards our Android users, we made it possible for iPhone and iPad users to access everything they need on the iOS app as well. We weren’t playing favourites, of course. Some trains just move a little faster than others. We also launched a lite version of our mobile booking experience for those who lack space on their phones and can’t possibly erase those 375 photos of Conrad, their adorable British Shorthair mix. We adapted our specially designed product for enterprises—Trainline for Business—to better suit the needs of our professional train bookers. Version 1.0 was already very affordable with all the bells and whistles included, but you’ll be happy to know that the newest version offers a free subscription as well. If you weren’t already aware that we offer a product for businesses, you have quite a gift awaiting you under the tree this holiday season. We have always stuck firmly to our goal of offering train tickets throughout all of Europe and then some… and then all. Starting with tickets from the private Austrian carrier WESTbahn, we made our big breakthrough into Austrian territory this year. This really opened doors for us in the way of eating more strudel. 2017 was additionally the year of coaches (the ones on wheels). We started selling tickets for 45 new coach companies since January. Forty-five! Our developers specialising in coach travel have not been idling. Most coaches we offer are sailing smoothly around Spain, but the last few arrivals in our search results cover airport-to-city centre connections in Paris, Rome, as well as others. Finally, we became polyglots this summer and translated our site and apps in 9 new languages, from Brazilian Portuguese to Mandarin Chinese. We also cashed in on the opportunity to display fares in 15 foreign currencies. Pretty practical if you’re curious about the price in Yen for your ticket to Zermatt this Christmas. You’re Yen for a treat. We hope that you enjoyed these gifts as much as we delighted in preparing them for you. We’ll see you in the year 2018. We will continue to set our sights high but our fares low, and we hope you’ll be a part of our continuing happy story. And by the way, we’d love to hear yours. Ah, October. The time of year, where supermarkets and shopping malls are all already eagerly getting into the festivities of Christmas. It seems that this year, SNCF has also taken on this merry spirit and will soon release their train tickets for the upcoming winter holiday period. So you can be sure to get your hands on these tickets before you even begin carving out your pumpkin for Halloween! What’s better than December 25th? October 12th! Mid-October traditionally calls for the sale of tickets for the holiday season (at least for SNCF trains). This year, the tickets will go on sale on Thursday, October 12th, and you’ll be able to book journeys starting December 10, 2017 to January 12, 2018. As usual, you will have to get up early (or stay up late – depending on your timezone) if you want to get the cheapest tickets. Like always, they go like hotcakes and are sold on a first come, first served basis. There is no set time announced for the sale, though we suggest to be ready to book by 06:00 in the morning (Central European Time). We highly recommend that you set yourself a reminder to avoid missing out on this sale – and most importantly – getting your hands on the lowest priced tickets available. Since we are always thinking of you and would very much dislike seeing you being late to the game, we’ve created a reminder event to add to your calendar. So make sure you add it, set an alarm and get ready to start booking your winter holiday tickets! Trainline Europe’s search API is a cornerstone of our product, as an online train and bus ticket booking platform. The search API is responsible for fetching and aggregating results from the carriers’ APIs. Without it, we couldn’t display train schedules, and we wouldn’t be able to sell tickets. We are always trying to make it perform better, and we always make sure it highlights the most practical results for our customers. One of my missions when I joined Trainline was to make sure the connection to external services (like carriers’ APIs) wouldn’t put our entire search API at risk. The purpose was to take the code of the carriers off the main application, then run this code in the context of small workers that consume less resources. These workers must be efficient at what they do, we should be able to start as many of them as we need to, and the part of the code connecting to external services should be isolated, which can’t be bad: if anything were to happen, we would rather see a carrier worker fail than the whole application. We use a Rails application to back a EmberJS frontend. So far nothing unusual, the Rails app is connected to RabbitMQ, user searches are sent to another application built with EventMachine, each payload is consumed and search results are returned to the Rails app. What is described in this blog post concerns the Ruby EM / Search API. Sometimes the services we need to contact are down or very slow, and when one of these services is not accessible, we don’t want to compromise the whole application. For example if the user searches for Paris -> Madrid, we need to contact both SNCF and Renfe, and if one of these APIs is not working we need to display a comprehensive error for the user, asking to try again later. We can’t have the applications hanging while users searches accumulate. Setting timeouts in the HTTP requests is important, but we realized early on that we needed more control over each of these services. We decided to extract the code belonging to each carrier, and run it in standalone, meaning we can have instances of the app running only the carrier’s code. These instances consume less RAM: around 280MB vs. 450MB for the whole app. Since we’re able to know how many searches we have for each country, we can set a number of instances of the application accordingly: if we have 50% of searches with a French origin and destination, we know we’ll need 50% of our workers to be SNCF. We achieved that with Ansible and Monit. When deploying, Monit configuration is regenerated with an Ansible template. We just have to update Ansible Yaml files to set the number of workers on the servers. Before launching the split of our Search application for a specific carrier, we were all happy and pressed the “deploy” button. Clients were starting to receive search responses handled by our splitted app and it was great. However something unexpected happened. properly so the amount of TCP connections to the queue exploded and RabbitMQ crashed. Setting timeouts is very important when contacting HTTP services but completely isolating the code was the real answer for us. With this setup we can adjust the number of workers for each service according to our traffic. We can also dispatch the workers on servers with varying degrees of performance. We also know that if anything happens, the main application won’t be compromised. In short, it’s an invisible step for you, our customer, but a big step forward for our search API. The Austrian WESTbahn Tickets Have Arrived on Trainline Europe! Our goal is to be your ultimate gateway to buying tickets for all rail operators in Europe; a booking platform that allows you to travel to where ever you wish to go. For that reason, we’re very proud to announce our partnership with WESTbahn. This is yet another step for us to enable your travel opportunities and master our ability in providing you with a comprehensive European booking platform. As of today, you’ll be able to book your WESTbahn tickets on Trainline Europe. So let’s get started and let us introduce you to our newest partner in the rail world. WESTbahn has connected Austria’s capital city since 2011 with the birthplace of Mozart. You may know Mozart as the legendary composer or simply the name behind the delicious chocolates that reflect the delicacy of his music. WESTbahn was named after the same the route that has been operative since 1860, when the first train steamed it’s way from Vienna to Salzburg. Back then, the journey would take around nine hours, though you can be glad it now only takes about two and half. For those looking to explore Austria, you can check many sightseeing wonders off your list with this route. In Vienna, you’ll begin by getting a full tank of cultural fuel by visiting the Museumsquartier, St. Stephen’s Cathedral and the beautiful baroque Belvedere castle. Fill yourself up with some culinary energy with nothing less than a hearty Schnitzel, potato salad and some good old apple strudel. Then digest it all on the WESTbahn as you travel towards the east of the country. Make an In-Between Stop in Linz! As WESTbahn tickets allow you to get on and off the train in between your final destination, we recommend making a stop at Linz. Step out of the train, stretch your legs along the Donau river and admire the ROA street art by the harbour. For the young: it’s your chance to take a nice picture for your Instagram and them hipster credits. For those who are a bit older, it’s your opportunity to familiarise yourself with a more civilised form of what used to be called graffiti art. If you simply would like relaxing some beach-time in this land-locked country, then make yourself comfortable in the city’s Sandburg. Be sure that you stock up on some provisions for your onward journey by getting an aptly named Linzertorte. What is it you may ask? It’s a traditional cake from Linz, rumoured to be the oldest cake in the world and a holiday season classic! Though we recommend eating it all year round (and certainly not one that has been around since the dawn of time – that certainly wouldn’t digest well). Once you’re done, get yourself back on board and continue on to Salzburg, where you can walk and trace the tracks of Mozart – right up to his birthplace – in the UNESCO world heritage historic centre. You’ll certainly not be short of any further desserts – the famed Salzburger Nockerl soufflé are certainly worth the journey (and calories)! • Wien Westbahnhof to Salzburg: Standard fare €26.50; WESTbahn Plus €46.40. • Salzburg to Westbahnhof: Standard fare €26.50; WESTbahn Plus €46.40. • Wien Westbahnhof to Linz: Standard fare €19,60; WESTbahn Plus €39.50. • Linz to Wien Westbahnhof: Standard fare €19.60; WESTbahn Plus €39.50. • Linz to Salzburg: Standard fare €13.40; WESTbahn Plus €27.30. • Salzburg – Linz: Standard fare €13, 40; WESTbahn Plus €27.30. If you indulged on some sweet and hearty Austrian desserts then do not worry – you can spare yourself some extra room! With the WESTbahn Plus ticket, you’ll have an extra free seat next to you. This will provide you with greater legroom, food and drinks served to your seat (in case you want to treat yourself some more) and you’ll get a daily newspaper too – so get ready to practice your German! What about an offer for kids? WESTbahn has made sure that kids are also covered with some great fare prices. Children up to 6 years travel free of charge and they do not require a ticket. Please note that these children must not travel unaccompanied and that WESTbahn cannot offer any assistance for them. So they will have to be in the company of someone older that can assist them with their travels e.g. a parent, friend or sibling. For children aged 6 to 14 years (on the day of travel) who travel in the company of an adult with a valid WESTbahn ticket, are charged € 1.00 – irrespective of the distance travelled. An adult can take along a maximum of 4 children paying €1.00 each. If you travel with a WESTbahn PLUS ticket, the upgrade fare will be charged for all accompanying children older than 6 years. Children from 6 to 14 years (on the day of travel) who travel on their own, the fifth (or more) accompanying children only pay half of the regular full fare. Lastly, please be aware that the ticket inspector is allowed to ask for a photo ID in cases of doubt about the age of a child. So it’s always useful to make sure the kids have some ID with them! For those that suffer from commitment issues and like to leave their plans open, you can be glad to know that if your ticket is purchased online, it’s valid for an entire year! Plus you can make as many stops as you like on the way. With Trainline Europe, you will of course also be receiving a special promotional offer with WESTbahn, such as the Spring WESTsavers Days (WESTspartage Frühling), which is valid until the 29th of June. The double decker (duplex) trains provide you with plenty of amenities. You’ll find the WESTcafé, which provides you with a vending machine for drinks, an air-conditioned and filtered smoking lounge. Yet the non-smokers have no need to worry, you can easily steer free from it as it’s closed off from the rest of the train. Toilets are of course provided on board. Plus there are bike spaces available, for which you can buy a reservation online for €5 or for €10 on board the train. On top of this, there is free WiFi in all WESTbahn trains, so you’ll be able to keep your friends up to date and make them jealous with your holiday pictures as you’re on the go. Don’t forget to send them to us either, we’d love to receive a picture of your trip on Twitter. The top speed of these trains is 200 km/h (that’s around 124 miles per hour), which isn’t as fast as some of the other high-speed trains, yet it gives you all the more opportunity to enjoy the beautiful scenery that passes you by. Thanks to the cooperation with WESTbahn and Meridian (a regional rail operator) in Germany’s Bavaria, there are 15 daily services between Vienna and Munich. You can simply step off in Salzburg and hop on to a Meridian Train – on the same platform – and it will bring you to Munich. The journey from Salzburg to Munich (via Rosenheim) takes just about 2 hours, so you can enjoy a creamy dose of caffeine in a traditional Viennese coffee house in Vienna and 4.5 hours later, you’ll already be drinking a cold beer in one of Munich’s famed beer halls. From Munich, you’ll find plenty of trains and connections heading in any direction that you wish: whether it’s onwards to Berlin for some sightseeing and night clubbing or to Zurich for some delicious chocolate tasting. From Zurich, you can take a Trenitalia train directly to Milan if you’re after some good old shopping. You can also jump off the train at Rosenheim instead of heading to Munich and there you’ll find plenty of Deutsche Bahn trains that will take you to Innsbruck, Bozen, Verona, with a final stop in Venice, where you can finish off the journey with a sunset gondola ride.